Swish, sniff, sip, spit, scribble. That, in a nutshell, is what it’s like being a judge at a cider competition, and when it’s the largest competition in the world, you get to do it over, and over, and over again. 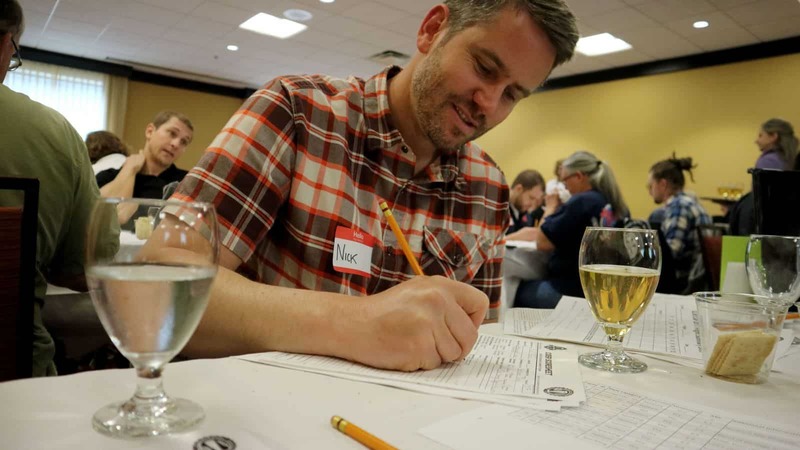 The twelfth Great Lakes International Cider and Perry competition, more commonly known by its acronym GLINTCAP, received a record 1,206 entries from 32 American states and 9 other countries this year, up 20% from 2016 and almost double that of 2015. (You can see all of the 2017 medal winners here.) The more than 10-fold jump in entries since the first competition in 2005 reflects the remarkable growth of American cider and the budding importance of the U.S. cider market. 2005 GLOWS Best in Show winner Mike Beck, Uncle Johns Cider, St. Johns, MI; Rex Halfpenny, Competition Organizer; Mary Halfpenny, Head Steward; and Patrick O’Connor, MSU Grad Student. 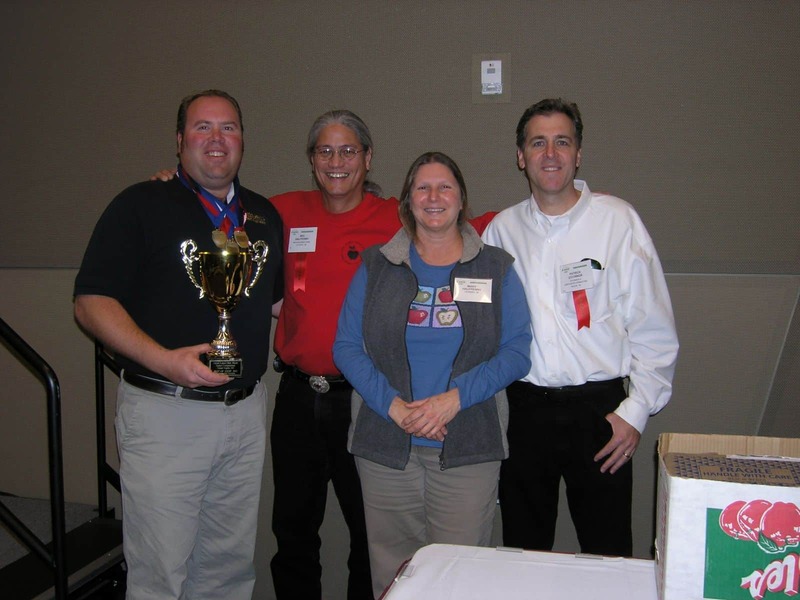 Held annually in Grand Rapids, MI, GLINTCAP has come a long way. Michigan has always had a lot of apples, and apple farmers, but by the early twenty-first century prices were down and the market was dominated by the apple powerhouse that is Washington and cheap Chinese concentrates. Enter Michigan State University graduate student Patrick O’Connor. Patrick thought that fermented cider might be the perfect alternative value-added product for Michigan farmers, especially as many farms already had the equipment and know-how to produce apple juice. There were just a handful of commercial cidermakers in Michigan then, so he needed a way to kickstart some interest. After getting a rather tepid response from the Michigan wine industry, Patrick approached Rex Halfpenny, an experienced producer of beer competitions and founder of Michigan Beer Guide. Together they ran a few tastings, then hit on the idea of a competition. In 2005 it was known as GLOWS, for Great Lakes Olde World Syder competition, and attracted 113 entries from six U.S. states and Canada, 45 in the commercial division and 68 submitted by amateurs. Its two-fold objective was to highlight the incredibly diverse range of cider styles and raise both funding for and interest in a trade association for Michigan cider. The first goal was easily met; the second took a little more time with the Great Lakes Cider and Perry Association (GLPCA) finally being formed in 2008 to serve the cider industries of Wisconsin, Michigan and New York. Working across state lines proved to be more complicated than expected, so today the GLCPA’s primary activity is conducting GLINTCAP. From the beginning, GLINTCAP has been run by like-minded individuals who want to do what they can to advance cider. For example, they started with the style guide and categories created by the Beer Judge Certification Program (BJCP), which had begun including cider sometime in the 1980s, but have continued to revise and refine them so that they more accurately reflect the American cider industry (which barely existed in 2005). Possibly more important, however, has been the competition’s emphasis on giving clear and informed feedback to entrants. It starts with a sensory and palate training program for judges held the night before the competition that is open to stewards and other volunteers as well (judges’ attendance became mandatory about five years ago). 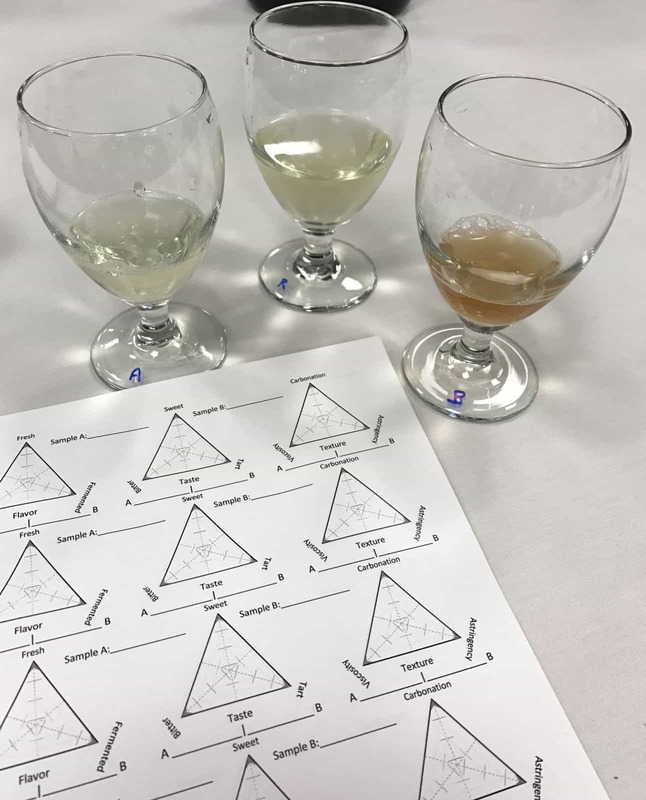 Developed and run by scientists/cidermakers Charles McGonagal and Gary Awdey, the program walks participants through a series of samples that exemplify the myriad aromas and flavors that can be encountered in a cider as well as some of the most common flaws. This kind of training gives judges not only a necessary skill set for evaluating a cider but also a common vocabulary that can be used to return comments to its maker. Each judge creates a written evaluation for each cider as it’s being assessed, and evaluations that are recorded and collated by GLINTCAP director Eric West and his staff before being sent on to the cidermaker. GLINTCAP Entries Organized and Waiting to be Poured by Stewards. It’s the attention to communication that makes this sort of competition so valuable. It’s not just an exercise in awarding a medal that can be used for marketing, but a rigorous consideration meant to raise the caliber of cider as a category. 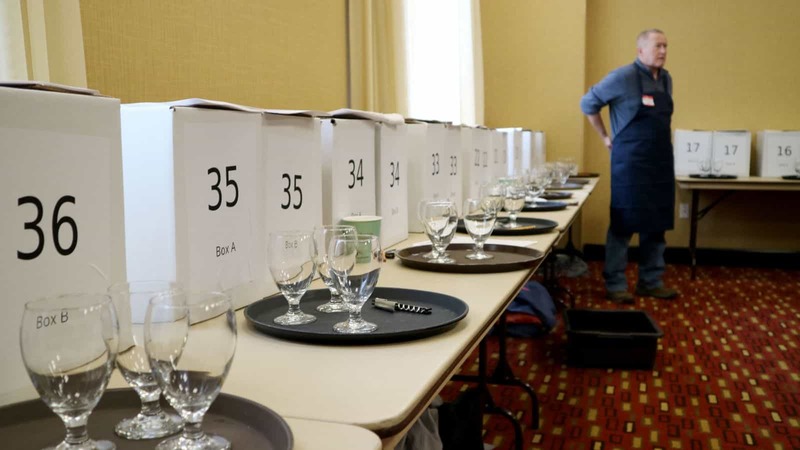 Time and time again judges are reminded that it’s not about what they like or don’t like as much as it is about fully describing what they experience in the glass and how closely a cider exemplifies the style of the category in which it is entered. That kind of appraisal coming from some of the most experienced palates in the industry can be invaluable in helping a cidermaker to raise his or her game. BenchGraft’s Nick Gunn Judging at GLINTCAP. The process is the same whether the entry has come from a commercial cidery or an amateur. In fact, as of this year all the ciders are evaluated in the same blinded flights to avoid even the possibility that a judge will have some bias against a nonprofessional’s entry. And this is just as well, for more than one amateur has used the feedback they’ve received from GLINTCAP to make the big leap into becoming a licensed business, including cidermakers such as Andy Sietsema (Sietsema’s Hard Cider), Chris Haworth (West Avenue Cider) and Ryan Burk (now head cidermaker at Angry Orchard). And so we judges swish the cider in our glasses, sniff its ripe bouquet, sip to savor its sumptuous flavors and spit, because there are still a host of ciders to come, and we must have our wits about us if we are to give each its due. Finally, we scribble, because we know that our comments have the potential to shape the future, or at the very least make someone’s day.